Oh Gennaro, brave of faith in Jesus Christ, glorious patron of Catholic Naples, looks upon us benignly and accepts our vows, that today we lie at your feet with total confidence in your powerful patronage. How many times have you run to help your fellow citizens, now stopping in the path of the destructive lava of Vesuvius, and now saving us from plague, earthquakes, famine and many other divine punishments that terrify us. The perpetual miracle of the liquefaction of your blood is a sure and extremely eloquent sign that you live among us, that you know our needs and that you protect us in a singular way. Oh, we pray you to pray for us, sure that we will be answered; and saved from all the evils that oppress us from all directions. Save us from unbelief, and you will see that the faith, by which you have generously sacrificed your life, always, always produces fertile fruits of saints made among us. The beloved Feast of San Gennaro is an annual celebration of the Patron Saint of Naples. When Januarius was 20, he became Bishop of Naplesand befriended Juliana of Nicomedia and Saint Sossius whom he met during his priestly studies. During the 1 1⁄2-year-long persecution of Christians by Emperor Diocletian, he hid his fellow Christians and prevented them from being caught. Unfortunately, while visiting Sossius in jail, he too was arrested. He and his colleagues were condemned to be beheaded at the Solfatara crater near Pozzuoli. Saint Januarius is famous for the miracle of the annual liquefaction of his blood, which, according to legend, was saved by a woman called Eusebia just after the saint’s death. Thousands of people assemble to witness this event in Naples Cathedral three times a year: on September 19 (Saint Januarius day, to commemorate his martyrdom), on December 16 (to celebrate his patronage of both Naples and of the archdiocese), and on the Saturday before the first Sunday of May (to commemorate the reunification of his relics). 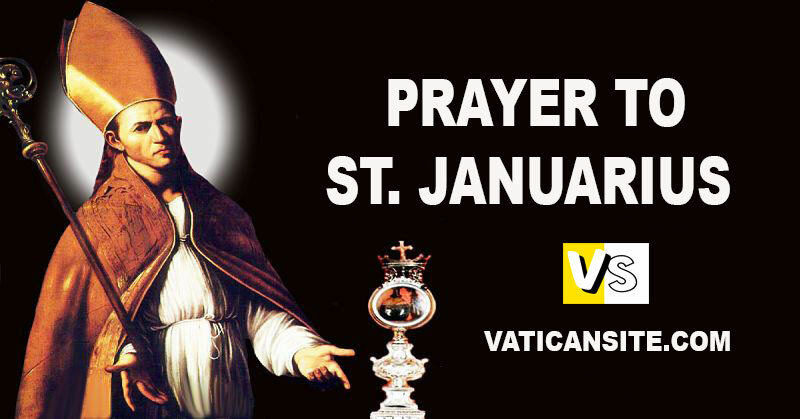 Saint Januarius please protect me and my family and assist me to pass my practical driving test tomorrow. My husband also is waiting for his exam result please give him a “Pass”. Please saint Januarius please protected me and ny gusband and family against all evil Amen ?????? Saint Januarius with your assistance, prayers, and blessings I passed my driving test Today from the deep of my heart I give thanks to you and the Holy Trinity. Please continue to intercede for my husband to have a pass for the exam result he is waiting for.